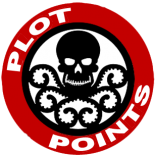 It’s the next episode of Plot Points TV! Our Play-By-E-Mail Breakout Game has been pretty well received by you, our readers. So, our fearless Watcher (Jayson) decided to do a post-game discussion about it. We talked about the behind-the-scenes work that went into getting the game running, what worked and what didn’t work, and how we got into playing our characters. Get to know the faces behind the characters… punching the bad guys… in the faces! What was the initiative house rule that everyone liked? Before, we were following a very linear initiative. You go, then someone else goes, then they go, etc. But with PBEM, that was very slow because not everyone could reply in a timely manner or at all during a busy week. So, Jayson decided to incorporate a new rule where he framed the scene and then we, the players, had free reign to act all at once (in a sense). It sped up play and made things more interesting. Thanks. I’ve tried that method before in PBP format and as Watcher, I found it made turns overwhelming. It would take hours to work through all the reaction rolls and narrative. Did you guys experience the same and did you find a way to overcome it? This entry was posted on January 11, 2016 by David W in Feedback, Plot Points TV, Videos.